The atmosphere is a chaotic system, and even negligible initial errors will give rise to gradual deviation of the forecast state from the true path, eventually resulting in chaos. This means that the weather has a predictability limit beyond which forecasts will lose all skill. Based on this, any single forecast is simply an estimate of the future state of the atmosphere within a stochastic framework, but provides no information regarding its reliability. Ensemble prediction offers one approach to generate probabilistic forecasts of the future state of the system based on a statistical sampling approach. In the past two decades, ensemble forecasting has been developed substantially to become a powerful approach that improves numerical weather prediction. The basic principle of the generation of initial ensemble members is to sample the uncertainties related to the initial analysis. Various ensemble generation schemes based on dynamical error growth theory have been tested and used in weather prediction centers; for example, the bred vector (BV) method used at NCEP, and the singular vector (SV) method at ECMWF. Recently, data assimilation (DA) schemes were further combined with the dynamical methods to better sample the analysis uncertainties, such as in the ensemble transform Kalman filter (ETKF) scheme. 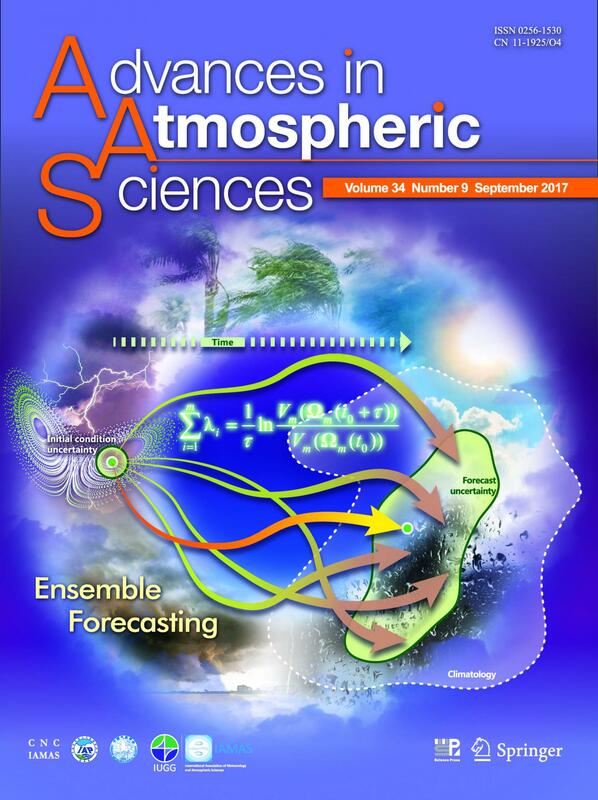 In a paper featured on the front cover of Advances in Atmospheric Sciences, Dr. Ruiqiang Ding of CAS Institute of Atmospheric Physics and his co-authors extend the definition of the NLLE from one- to n-dimensional spectra, and demonstrate the superiority of the NLLE spectrum in estimating the predictability of chaotic systems, as compared to the traditional Lyapunov exponent spectrum. In addition to estimating the predictability of chaotic systems, another important application of the NLLE method is to provide initial perturbations for ensemble forecasting. The results indicate that the NLLE scheme has similar ensemble forecasting skill to the ETKF scheme, both of which demonstrate better ensemble forecast skill compared with the BV and SV schemes. Despite the similar forecasting skills of the NLLV and ETKF schemes, the generation of the NLLVs is significantly more time-saving and easier to implement, as compared to the ETKF scheme. "We expect the NLLE scheme to be effective in generating ensemble perturbations in a high-dimensional numerical model," says Ding. "In future work, we intend to further investigate the performance of the NLLE through comparison with various methods in more complex models, and our ultimate goal is to apply the NLLE method in operational weather forecasts".